It all began with an introduction to Chalk Paint™ workshop at the lovely Country Mouse decor shop in Berkshire, UK. Having never heard of Annie Sloan or Chalk Paint™ before, we had no idea how easy it could be to recreate and breathe new life into any piece of furniture. The creative possibilities seemed endless, and we found ourselves analysing absolutely everything in our home searching for a reason why it needed to be painted with a shade of Chalk Paint™. With the view to moving back to South Africa in the not too distant future, and knowing that a strong creative pulse beats through our home country, the opportunity to bring the Annie Sloan brand and her wonderful Chalk Paint™ back home was something that could not be ignored. Annie Sloan is one of the world’s most respected experts in the field of interior decor and decorative painting, with over 40 years in the industry. 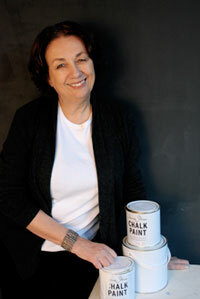 Having studied fine art, her knowledge of paint, pigments and art history led her to the development of her own very special decorative paint called Chalk Paint™. It is specifically designed for furniture, but can also be used on walls, floors, metal and adheres to most surfaces. The flexibility and user friendliness of her paint, allows the user to work in an independent, intuitive and creative way. In 1987 she wrote the phenomenally successful book ‘The Complete Book of Decorative Paint Techniques’ which was followed by over 20 other books on traditional paints, colours and techniques and has led to total sales of well over 2 million books worldwide in 11 languages. Her decorative products are sold throughout the UK, Europe, the US, Canada, Australia and New Zealand and now we are excited to be able to offer her paint, soft waxes and books in South Africa.